Spanish classical guitarist Anabel Montesinos plays Asturias (Leyenda), a musical work written by the Spanish composer Isaac Albéniz. This video was recorded in 2010. It was originally written for the piano and set in the key of G minor, and first published in Barcelona, by Juan Bta. Pujol & Co., in 1892 as the prelude of a three-movement set entitled Chants d’Espagne. The name Asturias (Leyenda) was given to it posthumously by the German publisher Hofmeister, who included it in the 1911 “complete version” of the Suite española, although Albéniz never intended the piece for this suite. Despite the new name, this music is not considered suggestive of the folk music of the northern Spanish region of Asturias, but rather of Andalusian flamenco traditions. Leyenda, Hofmeister’s subtitle, means legend. The piece is noted for the delicate, intricate melody of its middle section and abrupt dynamic changes. Isaac Albéniz (29 May 1860 – 18 May 1909) at the piano (1901). He is best known for his piano works based on folk music idioms. Albéniz’s biographer, Walter Aaron Clark, describes the piece as “pure Andalusian flamenco” with a main theme that mimics the guitar technique of alternating the thumb and fingers of the right hand, playing a pedal-note open string with the index finger and a bass melody with the thumb. The theme itself suggests the rhythm of the bulería – a song from the flamenco repertoire. The ‘marcato’/’staccato’ markings suggest both guitar sounds and the footwork of a flamenco dancer. The piece sounds as though it is written in the Phrygian mode which is typical of bulerías. The second section is a reminiscent of a copla — a sung verse following a specific form. 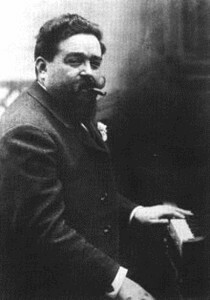 Clark states that it is written in typical Albéniz form as it is “presented monophonically but doubled at the fifteenth for more fullness of sound. The music alters between a solo and accompaniment that is typical of flamenco. The short middle section of the piece is written in the style of a malagueña — another flamenco style piece. The malagueña borrows two motives from the previous copla and builds on them. The piece returns to its first theme until a slow “hymn-like” passage ends the piece. Many have attributed the first transcription for guitar to Francisco Tárrega who put it in its most recognizable key, E minor. According to guitarist and guitar scholar Stephen Yates, the first guitar transcription of the piece was probably by Severino García Fortea, although Andrés Segovia’s transcription is the most famous and most influential. The piece has become one of the most important works of the classical guitar repertoire. Anabel Montesinos is a leading figure of the classical guitar worldwide and a winner of several major international guitar competitions. She was the youngest winner of the Francisco Tárrega International Guitar Competition in Spain, at the age of 17 years old. Winner of many other major guitar competitions such as the Michele Pittaluga, Citá di Alessandria in Italy and the Andrés Segovia in Spain, Anabel Montesinos has performed concerts all over the globe. She made her debut at Carnegie Hall in 2011, has performed several times at the Tchaikovsky hall in Moscow, and has performed with orchestras like the Philharmonic of Turin-Italy, Philharmonic of Oulu (Finland), Havana Philharmonic (Cuba), and Philharmonic of Moscow (Russia). She has recorded for the label Naxos, and her first CD was chosen as a part of the music program for intercontinental flights by the British Airways. Anabel Montesinos is a Savarez Artist and performs with Cantiga Blue strings; her guitar is a Simon Marty from Australia.